Welcome to the second installment of our new series in which we'll be posting an introduction from one of our favorite new books for your reading pleasure. 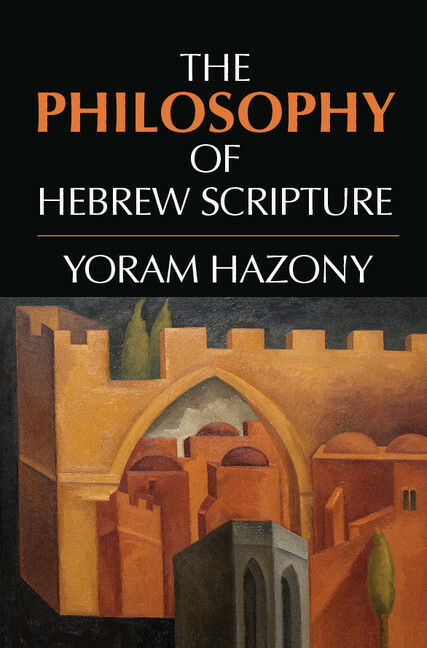 This week we're sharing Yoram Hazony's introduction to his soon to be published book The Philosophy of Hebrew Scripture. What are we to make of the Bible? It’s not easy to say. But a common approach goes like this: There are two kinds of literary works that address themselves to ultimate issues – those that are the product of reason; and those that are known by way of revelation. Works by philosophers such as Plato or Hobbes are works of “reason,” composed to assist individuals and nations looking to discover the true and the good as best they are able in accordance with man’s natural abilities. The Bible, on the other hand, is “revelation,” a text that reports what God himself thinks about things. The biblical texts bypass man’s natural faculties, giving us knowledge of the true and the good by means of a series of miracles. So what the Bible offers is miraculous knowledge, to be accepted in gratitude and believed on faith. On this view, revelation is seen as the opposite of reason in that it requires the suspension of the normal operation of our mental faculties, calling on us to believe things that don’t make sense to us – because they are supposed to make sense to God. The dichotomy between reason and revelation that is the basis for this understanding of the Bible has a great deal of history behind it. The fathers of the Christian Church adopted it as a way of sharpening the differences between the teachings of the New Testament and those of the various sects of philosophers with which they vied for converts in late antiquity. Many centuries later, the philosophers of the Enlightenment embraced this same distinction as an instrument with which to bludgeon the Church, using it to paint Christianity as a purveyor of superstition and irrationality. Fideists and heretics alike have thus had ample reason to insist on this distinction, and many continue to do so even today. A case can be made that the reason–revelation dichotomy does succeed in capturing something of what was unique and compelling about the teaching of Jesus’ apostles in the New Testament. But it’s much harder to make sense of this distinction in the context of the Hebrew Bible (or “Old Testament”*). After all, the principal texts of Hebrew Scripture were written perhaps five centuries before the reason–revelation distinction was applied to them. They were written by individuals who spoke a different language from the Greek in which this dichotomy was framed, and professed a different religion from the Christianity whose virtues it was designed to emphasize. Moreover, nothing in the principal Hebrew texts suggests that the prophets and scholars of ancient Israel were familiar with such an opposition between God’s word and the pronouncements of human reason when it is working as it should. In addition, the texts of the Hebrew Bible seem largely uninterested in the subjects that made the concept of revelation so important and useful in explaining Christianity. The hidden secrets of God’s previously unrevealed plan for mankind, the salvific power of faith, the availability of eternal life – none of these subjects are even top-forty in the Hebrew Scriptures, a fact so obvious and so jarring that it prompted Kant to argue that the Judaism of ancient Israel was not really a religion! What is in the Hebrew Scriptures? Many of the same kinds of things that are found in works of reason: histories of ancient peoples and attempts to draw political lessons from them; explorations of how best to conduct the life of the nation and of the individual; the writings of individuals who struggled with personal persecution and failure and their speculations concerning human nature and the search for the true and the good; attempts to get beyond the sphere of the here and now and to try and reach a more general understanding of the nature of reality, of man’s place in it, and of his relationship with that which is beyond his control. God is, of course, a central subject in the Hebrew Bible. But to a remarkable degree, the God of Israel and those who wrote about him seem to have been concerned to address subjects close to the heart of what later tradition calls works of reason. Which raises the following question: What if the analytic framework that originally assigned the Hebrew Bible to the category of revelation was in fact ill fitted to the older Hebrew texts? What if its effect, historically, has been to force subsequent readers to see the Hebrew Scriptures as the early Christians saw them, eclipsing the concerns of the Jewish prophets and scholars who wrote them? What if the texts of the Hebrew Bible, or many of them, are in fact much closer to being works of reason than anything else – only we don’t know it because this fact has been suppressed (and continues to be suppressed) by an alien interpretive framework that prevents us from seeing much of what is in these texts? It is my contention that something like this is in fact the case: that read into the Hebrew Scriptures, the reason–revelation dichotomy becomes a kind of distorting lens – greatly exaggerating aspects of the old Hebrew texts that their authors would never have chosen to emphasize, even as it renders much that was of significance to them all but invisible. This means that in reading the Hebrew Scriptures as works of “revelation” (as opposed to “reason”), we come pretty close to destroying them. We accidentally delete much of what these texts were written to say – and then, having accomplished this, we find that the texts don’t really “speak to us” as modern men and women.